The temple is located on the Tanjavur - Tiruvaiyaru route. The Moolavar is Harasaabavimosana Perumal seen in standing posture facing East. This lord is said to have rid Lord Siva of the sin of plucking one of Brahma's heads (the same reason is believed in Thiru Karambanur also). There is an idol with Chakarathalwar sculpted in the front & Narasimhar at the back. But the idol is placed against a wall & so it is not possible to get the darshan of Lord Narasimhar. 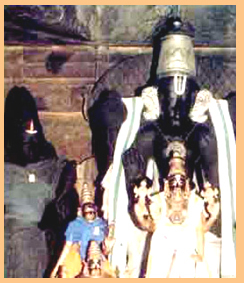 There are separate temples with gopurams for the trinities Brahma, Vishnu & Siva. The Brahma temple has been shut down & the idols of Brahma & Saraswati are placed in the Siva temple. Lord Siva is worshipped as Brahma Sirasa Kandeeswarar. Theertham - Kabaala Moksha Pushkarini, Padma Theertham, Kabaala Theertham, Kudamurutti river. The Moolavar of this temple is Sri Hara Saabha Vimocchanapperumal. Moolavar in Nindra (Standing) position facing East directipn. Prathyaksham for Agathiya Munivar. It is located at around two kilometers from Thiruvaiyaru and seven kilometeres from Thanjavur on Thanjavur - Thiruvaiyaru Road.The temple on the roadside just before the bus stop.